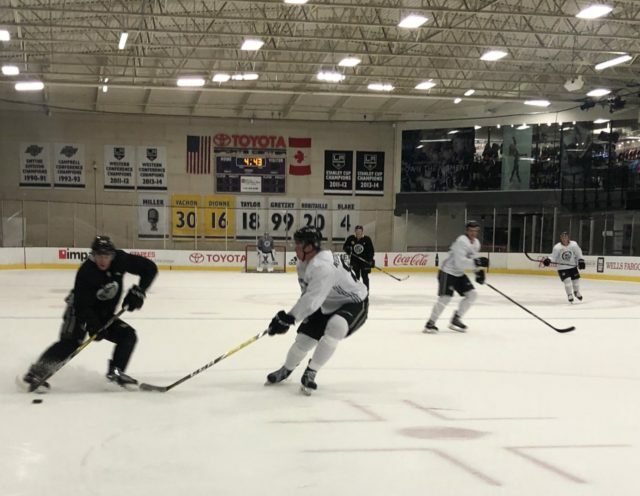 Day 1 of Los Angeles Kings Development Camp is in the books. The 2018 NHL Entry Draft saw the Kings select seven prospects and six of those players were on the ice today in El Segundo as a part of a roster of 34 players. For the first time since 2009 and 2010, the Kings made first round picks in back-to-back seasons and both of those picks, forwards Gabriel Vilardi and Rasmus Kupari, were in action today. 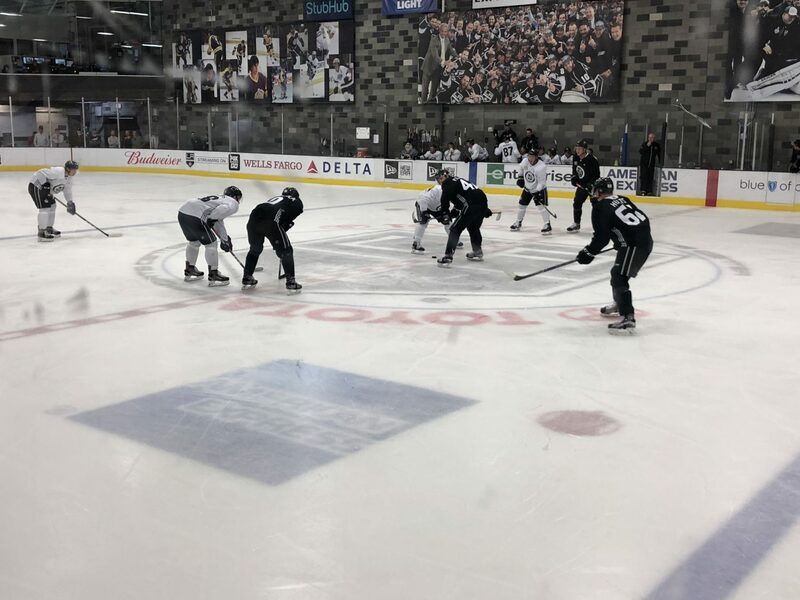 Each positional group – forwards, defensemen and goaltenders – skated separately in the morning before the groups got together in afternoon sessions that featured an extended scrimmage. It can be weird to think of an 18-year old player as being a “veteran” but a veteran presence is exactly what Gabriel Vilardi brings to Kings Development Camp. While Vilardi did not suit up with the Kings during the 2017-18 season, an injury kept him in Los Angeles throughout training camp and into the beginning of the season, which allowed him to function around NHL players on a day-to-day basis. Vilardi’s experience with the culture of the Kings organization at the NHL level was something that Mike Donnelly of the Kings Player Development department feels is a major factor at this week’s camp. While the on-ice action is the part of a development camp that gets the most attention, this week is as much about learning off the ice as it is on the ice. For the Player Development staff, getting to know prospects in just a week’s time can be a challenge but it’s a major piece of what this camp is about. “It’s getting to know the players, developing a relationship with them, teaching them, the game is so complex there’s a lot of stuff that we have to teach,” Donnelly said about the off-ice facets of development camp. “We want to know them not just as hockey players and I think that’s important when you’re doing development. I’m not their coach, [Nelson Emerson]’s not their coach, [Glen Murray]’s not their coach, Mike O’Connell, we’re not their coaches, we’re almost like teachers. It’s awesome for us and I think it’s great for them. We see them in the morning and they’re excited to see us, ‘what are we going to do, what are we going to work on’ it’s a really, really good environment. Today’s skates marked the debut of forward Rasmus Kupari, the first time he’s been on the ice in a Kings’ jersey. Kupari stood out in the early sessions this morning with his quickness and slick style that was highly touted from the draft. The Finland native has had a whirlwind week, arriving in Dallas for the NHL Draft on Thursday and then heading straight to California for Development Camp this week, with today’s skate being his first organized team activity. That special feeling of wearing the Kings logo for the first time was not lost on Kupari, who spoke very highly of the organization, his coaches and the city of Los Angeles. Also on the ice for day one was the “Cloud Connection” as three different St. Cloud State products – Easton Brodzinski, Mikey Eyssimont and David Hrenak – all suited up for the Kings. The trio of players were all teammates on the Huskies during the 2017-18 season as St. Cloud skated to the number one seed in the NCAA Tournament. Of the three, Brodzinski is perhaps best known to Kings fans as he is now in his second development camp, having also attended the 2017 edition. In addition to his St. Cloud State ties, Brodzinski is also the brother of Los Angeles and Ontario forward Jonny Brodzinski, who has skated professionally with the Kings and Reign over the past three seasons. Both ties, collegiate and family, have made the transition to a professional camp that much easier for Brodzinski. Brodzinski is one of 10 returnees from development camp a season ago and his familiarity with the process has helped him to assimilate the second time around. “It’s been nice, it feels like the same thing as last year so far,” Brodzinski said. “All the guys have been great, it’s a great development staff and everyone’s been nice so it’s nice to come back and feel right where I left off last year. Speaking of second development camps, Donnelly mentioned a notable difference between seeing players at last year’s development camp as opposed to seeing them again this season. Donnelly specifically mentioned Vilardi and forward Drake Rymsha as players that have stood out as players with experience under their belts. 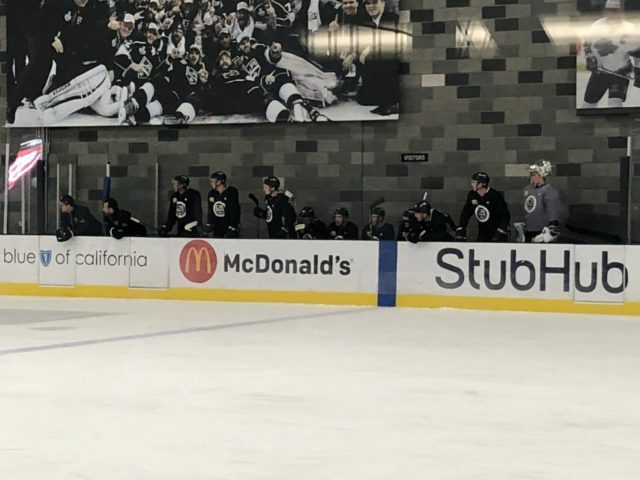 Donnelly pointed out the extensive amount of information and teaching that goes into a development camp week as a reason that players come back stronger in their second camp. *One note – Via Kings Hockey Operations, goaltender Cole Kehler missed today’s on-ice sessions with a minor injury and is day-to-day.